e-post(유럽문화체험) - 여행자들의 심리 "비행기 탑승게이트 앞 줄 서는 사람들"
여행자들의 심리 "비행기 탑승게이트 앞 줄 서는 사람들"
Why DO people queue so early for flights? 공항에 가면 비행기 탑승 1시간 전부터 게이트 앞에서 대기하며 줄을 서는 승객들을 심심치 않게 볼 수 있다.좌석은 당연히 지정돼있다. 그럼에도 불구하고 기내에 가장 먼저 입장하려는 사람들로 긴 줄이 늘어서지기 일쑤다. 실제 탑승 시간보다 훨씬 미리 도착해서 줄까지 서 있으려는 사람들은 어떤 심리를 가지고 있을까? 최근 영국의 행동학 전문가 주디 제임스는 현지 일간지 데일리메일을 통해 이런 사람들의 행동에 숨은의미를 분석했다. But why are we so keen to get onto the plane first, where you only have to wait in cramped quarters for at least half an hour until the rest of the customers have boarded? Behaviour expert Judi James reveals all to MailOnline Travel about the psychology of the boarding gate queue. 일명 FOMO, Fear of Missing Out의 줄임말로, 모임이 끝날 때까지 자리를 뜨지 않으며 모임이나 행사초청을 절대 거절하려 하지도 않는 등 좋은 기회를 놓치고 싶지 않은 심리를 뜻한다. 미리 줄을 선 사람들을보면 자신도 그 기회를 차지하고픈 마음이 생기면서 함께 줄을 서게 된다는 것. "줄을 서는 사람들의 심리는 전염되기 마련이다. 언제 어디서나 줄을 선 사람들을 보면 흥미를 보이며 대열에 동참하는 것과 같다"면서 "당신의 뇌가 '미리 줄을 서나 마지막에 들어가나 별 차이 없다' 라고 말해도 좋은 기회를 놓치고 싶지 않은 마음에 줄을 서게 된다"고 설명했다. 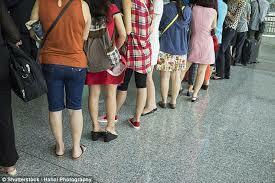 James said: 'The psychology of queueing is contagious - anywhere we see a queue, we feel impelled to join. James said: 'Even though we know that a desire to be at the front is just the way some people are, there is also a burning desire in most of us to "Beat The Cheat". 'This is a very alpha thing - we feel as if them being in front or somehow managing to beat the system also diminishes us and makes us the secondary alpha. James said: 'Travelling itself is a very serious business for us - we kind of exist in a state of high anxiety even if we don’t mind flying. ◆ 목적이 있을 때 시간은 더 빨리 흐른다. 약속이 있을 때와 없을 때, 시간의 속도가 다르게 느껴지기 마련이다. 예컨대 비행기 탑승시간이 정해진 날이면 1시간이 5분처럼 빠르게 흐른다고 느낀다는 것. 제임스 박사는 "탑승 게이트에 있을 때가 라운지를 배회할 때보다 시간이 더 빠르게 간다고 느끼면서 조급한 마음에 줄을 서게 된다"고 설명했다. James said: 'When we have a purpose, time goes faster. 'This is why an hour can feel like three weeks if you're bored, but an hour can also feel like five minutes when you have to get up in the morning. ◆ 사람은 텃세(세력권)가 강한 동물이다. 제임스 박사는 "사람들은 머리 위 선반의 공간이 충분하다는 것을 알면서도 자신의 머리 위에 타인의 짐이 보관되는것을 원치 않는다는 이유로 가능한 빨리 탑승해 짐을 올리려한다"면서 "일부는 머리 위 선반 뿐만 아니라 옆 좌석의 사람과 함께 사용하는 팔걸이를 독차지하기 위해 줄을 서가며 빨리 탑승하려 한다"고 설명했다. 이어 "사람은 자신의 세력을 매우 중시한다. 만약 예상했던 충분한 공간이 주어지지 않을 경우, 자신의 세력이나 기회 등을 빼앗겼다고 여기는 경향이 강하다"고 덧붙였다. James said: 'One of the most common reasons people give for queuing early is the lack of overhead luggage space on some flights. 'Even though you know you will probably be fine with overhead storage, you don't want to be the one who has to put their luggage in the hold and you also don’t want to be the person who can't get their elbow on the arm rest. ◆ '퍼스트 클래스 심리'를 가진 사람이 있다. 줄을 서면서까지 가장 먼저 탑승하거나 혹은 가장 마지막에 탑승하려는 사람들에게서는 공통적으로 퍼스트클래스의 심리를 찾을 수 있다. 스스로를 가장 먼저 탑승할 만한 사람 혹은 가장 마지막에 탑승해도 가치있는 사람으로 여기는 경향이 있기 때문이다. 제임스박사는 "일종의 집단적 본능에서 나오는 현상"이라면서 "맨 앞 혹은 맨 뒤의 위치가 적에게 공격받을 위험이 가장 높음에도 불구하고 스스로에게 자신있는 동물들은 가장 먼저, 혹은 가장 나중에 자신이 원하는 것을 취하려 한다"고 설명했다. James said: 'Those who wait until the last moment to get on the plane have a first class mentality - in life they’ve learned they can get what they want through charm and being demanding... they are the kind of people who when their taxi has arrived, light up another cigarette. 'This first-class mentality is actually shared by those who start queuing first though, because they are willing to do something as they see themselves as deserving. 'The rest of us are those who see the queue starting and are reminded of being a victim in the past, so they join. 비행기내에서 착륙전 먼저 내리려는 사람들의 이야기, 대부분 사람들의 심리상태를 보여준다. 'People love a good queue. 'What is even more baffling than the scrum to get on is the need to immediately jump from your seat as soon as the seat belt sign goes off after arrival (or in some cases whilst the aircraft is still moving). When there are 100 people between you and the door, which is at least three minutes away from being opened, why not sit still, carry on reading a book and relax?